The Founders Rebelled with Arms for far Less Grievances than we face, so should we follow their lead or not? 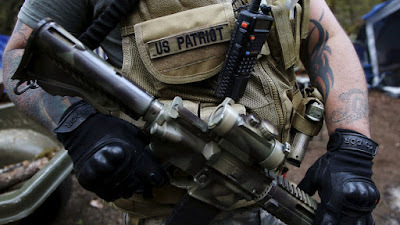 So, a group of Americans, calling themselves patriots, have armed themselves and have taken over a U.S. government building somewhere in Oregon. Just a brief aside, does anyone else find it ironic that this is happening in one of the most left-leaning states in the country? Anyway, there are those who are lamenting this as a poor decision and telling anyone who will listen how this is no way to make a point or achieve one's goals. You've seen/heard them. What I find fascinating is that this is yet another example of the inability to remain intellectually consistent and think things through. These same people tell stories of how our Founders rebelled against a tyrannical government to create the very nation that they so proudly claim is the land of the free. They speak proudly of how the Founders had sought redress on numerous occasions in numerous ways and were rebuffed, so they resorted to the only means left to them.Those Founders they are so fond of, whose praises they sing to the masses, rebelled because of.............taxes (and other abuses of power). Taxes that were levied without proper representation of the citizens who were being taxed. Abuses that showed a lack of respect for human rights by a tyrant. Think it through. I ask you, How much is too much? How do we know when the "time is right?" At what point do we take the same stand that our Founders did and send an unmistakable message to tyrants of every stripe? When will we live up to the standard set by our Founding Fathers?